With your Lantern Pass, you will receive a wristband granting you entrance to the event, a lantern, a marker, and a s'mores ingredients. 1 box of matches per party. Have your friends and family sit at a VIP fire pit. You and up to 6 friends (each person needs to purchase a Lantern Pass if you have not already) will have a reserved fire pit. 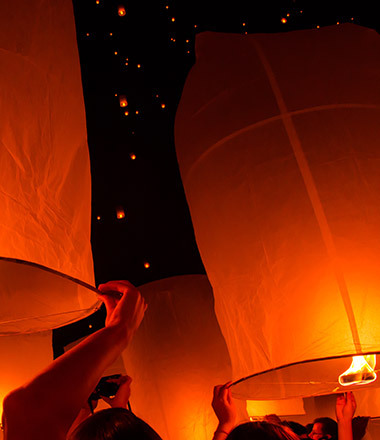 You will also receive 6 additional lanterns, a gift bundle, and have access to VIP restrooms. Lanterns will fly when the sun goes down and when the Fire Marshall approves. Be sure to arrive early enough to park, check-in and find a place to enjoy the event. Lantern Kit: (1) lantern per ticket, a marker, and s’mores ingredients.1 box of matches per party. Kid’s Pass includes: Access to face painters, balloon twisters, bounce house, and meet and greet with princesses.